“The Storytelling Project” is a devised theatrical show featuring the UMKC second year MFA actors, MFA designers and undergraduate production staff. “It is a journey to the Andean Cosmovision (a way of perceiving and interacting with reality that is found in the indigenous culture of the high Andes) by way of the personal conflicts we face, where time and space are disrupted and the essence of who we truly are is revealed,” said Karen Lisondra, director. As part of their graduate program, UMKC MFA students explore various forms of physical theatre experiences. Devised theatre refers to a collective collaboration where the script, or performance score, is developed by the ensemble. The heart of devised theatre involves talking from a person’s own life and putting it into the show. It is designed to push the artists outside their comfort zone. Emilie Leia Karas plays the role of Caporal. Specifically, “The Storytelling Project” explores intimate and imaginative relationships through the Andean Cosmovision’s concept of Pachakutec, or time/space reversal. Student actors wrote their own “soul texts,” which became their script. The characters and masks were designed and painted by the students and constructed by Warren Ludwig. Most are inspired from pre- Incan era archetypes, with the exception of Caporal, which is a satirical reflection of Bolivia’s Hispanic colonization. Lisondra began working with the students during the fall semester. After she learned more about them, she was able to assign the characters to the actors. Amado Espinoza composed and directed the music. He also aided in scene conceptualization. The MFA actors have been together for a year and a half. They’ve learned to work together and are learning how to change as a team. In addition to Karas, the ensemble for “The Storytelling Project” includes Chelsea Kinser as Opoj, the mountain mystic; Jason Francescon as Ciervo, the humble deer; Marianne McKenzie as Kusillo, the trickster; Khalif Gillett as Whapuri, the weaver of worlds; Yetunde Felix-Ukwu as Ana, the wise ancestor; and Freddy Acevedo as Jacha Tata Danzanti, the sacrifice. UMKC students also working on the production are MFA designers Bryce Foster, lights; Sandra Lopez, set; Zack Pierson, Sean Obrecht, Stephen Jarvis and Matthew Schorr, sound design. Colin Fowler, MFA student, is stage manager; Meg McSweeney, freshman, is assistant stage manager; and Tyler Fasching, junior, is production assistant. “Every person will take something different away,” Kinser said. “Come to see the power of the human body that doesn’t cost a lot,” Gillett said. 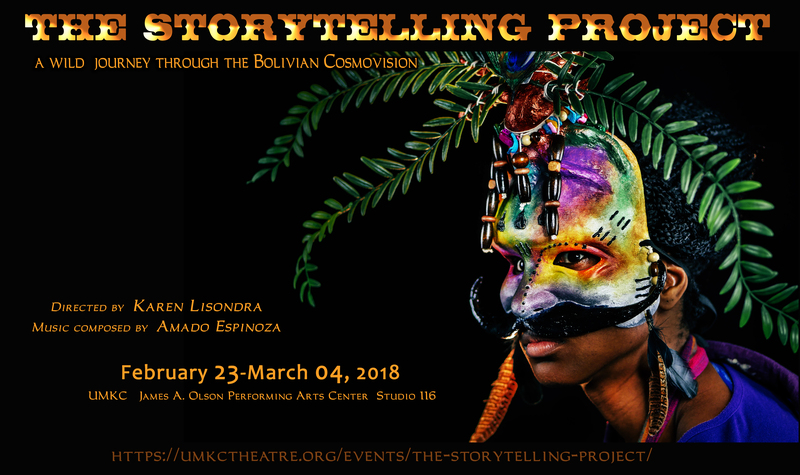 “The Storytelling Project” runs Feb. 23 through March 4 in Studio 116 of the UMKC Performing Arts Center. There will be a talk back on Tuesday, Feb. 27, following the show, which allows the audience to ask questions of the cast and crew. Tickets can be purchased from the UMKC Central Ticket Office. Free parking for the performance is available on levels five and six of the Cherry Street Parking Garage, 5000 Cherry St., Kansas City, Mo.